At the prime age of 38, journalist Hera Diani found herself pregnant after being child-free by choice for 10 years. After the initial shock wore off, she decided to do something that writers tend to always do: chronicle her experience. Being unable to draw even if her life depended on it, she sought the help of illustrator Adhitya Pattisahusiwa to visualize her story. Taking the title of an MTV reality television series â€œ16 and Pregnant", this graphic book presents an honest and witty account of a first pregnancy, an experience already fraught with problems for women in general, but even more so for one society usually labels as being already of a "mature" age. What a writer to do when a major life event happens? Write about it, of course. But this time, as a comic book fan, I wanted to do it differently. Since I can`t draw, I asked my talented cousin and Magdalene`s illustrator Adhitya Pattisahusiwa to visualize my words. So, here it is, the graphic series that chronicles the adventure Enjoy! Talkshow dan peluncuran buku '38 and Pregnant" oleh Hera Diani dan Adhitya Pattisahusiwa berlangsung di Aksara Kemang Raya 8b, Jakarta 12730, pada hari Sabtu, 17 November 2018, jam 15.00 WIB - selesai. 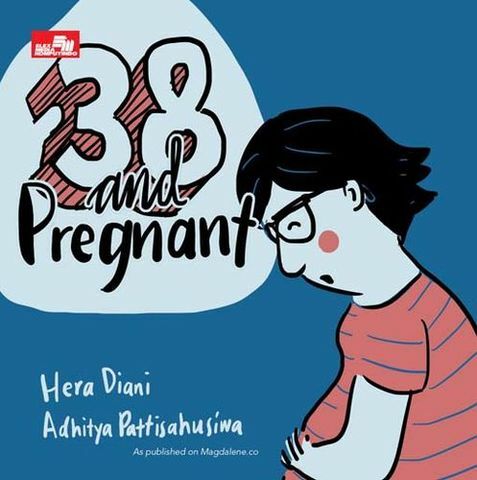 Talkshow and the Launch of Graphic Memoir '38 and Pregnant" by Hera Diani and Adhitya Pattisahusiwa @Aksara Kemang Raya 8b, Jakarta 12730, Saturday, 17 November 2018, 03.00 PM - till end.